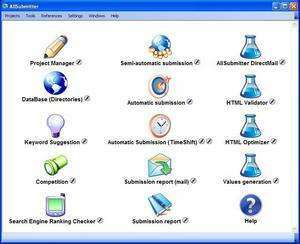 12 SEO Tools in One Powerful SEO Suite; plus, AllSubmitter is the most complete article and directory submission software package on the planet. AllSubmitter offers many powerful tools that help you to get top 10 rankings on Google and other major search engines. AllSubmitter 7.6 is a shareware program and can be used as a demo to try the software until the free trial period has ended. A full version of the program is available after the trial period ends. For security reasons, you should also check out the AllSubmitter download at LO4D.com which includes virus and malware tests. Additional screenshots of this application download may be available, too.